L to R: Officer Vinny Rivera with his painting of K9 Ty. Chief Jason Cripps with his painting of Sgt. Beau. Deputy Donnie Brown with his painting of K9 Tanja. Presented at the WRTP K9 Memorial event. Do you want to sponsor a K9 Hero painting for one of our country's military or law enforcement officers? Do you know of a police or sheriff's department with a K9 unit that deserves recognition for their contribution to their community? The K9 Hero Portrait Project welcomes sponsorship for K9 hero paintings of law enforcement and military canines all over the WORLD. Just like nonprofit organizations that request sponsorship for K9 ballistic vests which are sometimes sponsored by one individual or a group, we can do the same. Sponsorship of a painting does not require the K9 to have been lost in the line of duty. The K9 may still be an active officer within the community, or, may have passed due to age or health. Either way, they are all heroes and can get the same quality painting done as our fallen K9 officers. If sponsored by one or individual will have their names engraved on a brass plate that is attached to the painting (ballistic vests have a patch indicating who sponsored the vest). 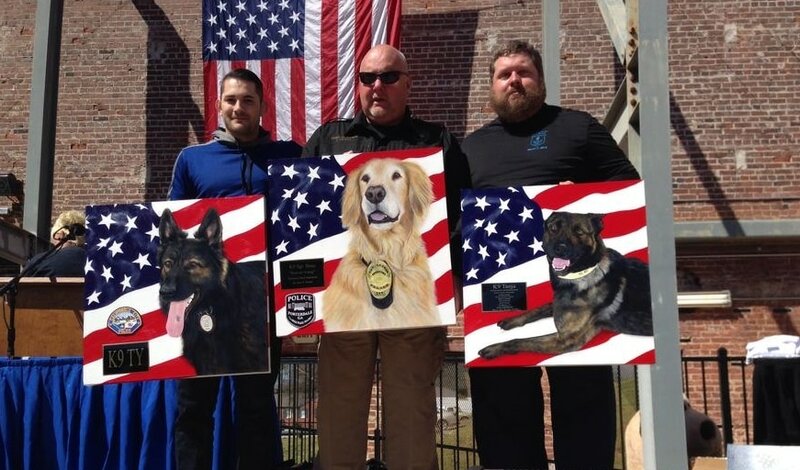 If sponsored by a group or community, a plaque will be engraved and presented with the painting so the handler can see who made the painting of their K9 partner possible. Over 100 hours goes in to each portrait with only the highest quality paints used. Sponsorship for each 24" x 24" gallery wrapped canvas K9 Hero painting is $1500. This includes shipping to the department or officer. If an in-person presentation is requested, hotel and travel must be arranged by the requester. All fully sponsored paintings are at the 1st position in the queue to be painted after the current project is completed. There are currently over 20 heroes waiting to be painted (accepted in to our program over the course of the prior 12-18 months), so if you would like to help aid in their sponsorship to help get their paintings completed, their handlers would greatly appreciate it. Email us for more information regarding sponsoring a K9 Hero portrait. Individual sponsor plates on the left, multiple sponsor plaques on the right.